Thank you, Bob’s Red Mill for sponsoring this post! All opinions are my own. 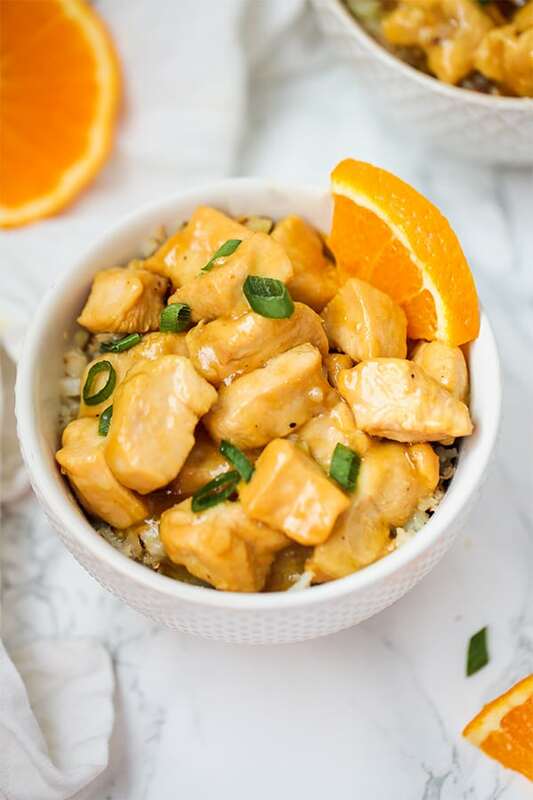 This slow cooker orange chicken tastes just as good as what you’d find in a restaurant! It’s easily made in the slow cooker, and is paleo, gluten-free, AIP, and all around healthier! Growing up, I was always the teriyaki chicken lover in the family. That’s why I made my slow cooker teriyaki chicken, and why it remains one of my favorite ways to eat chicken. While I was eating teriyaki chicken to my heart’s content, it was my younger brother who was the orange chicken fan. He probably ate his weight in orange chicken once every quarter when we were kids. I don’t remember my mom ever making it at home, but I remember the takeout! It’s no secret that takeout leaves a lot to be desired. Not only can it be a hit or miss flavor-wise, but very rarely is it actually healthy. 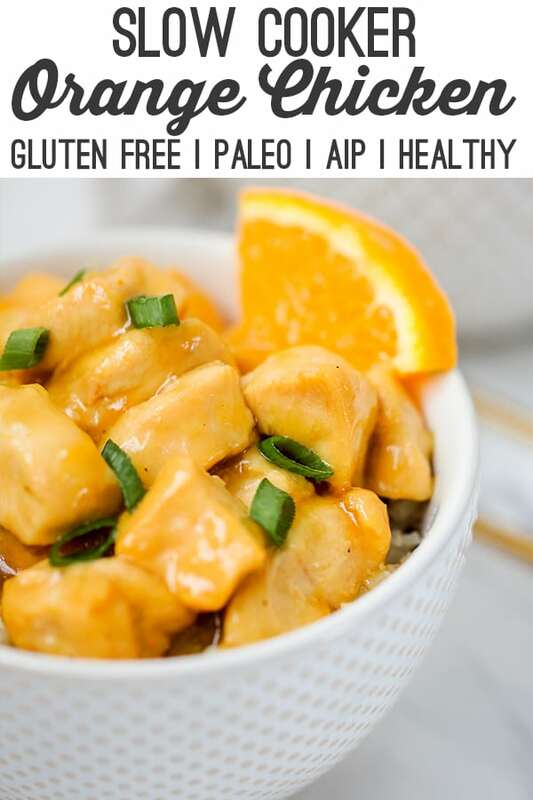 Takeout or restaurant orange chicken is loaded with soy, gluten, MSG, sugar, and just isn’t exactly health promoting. 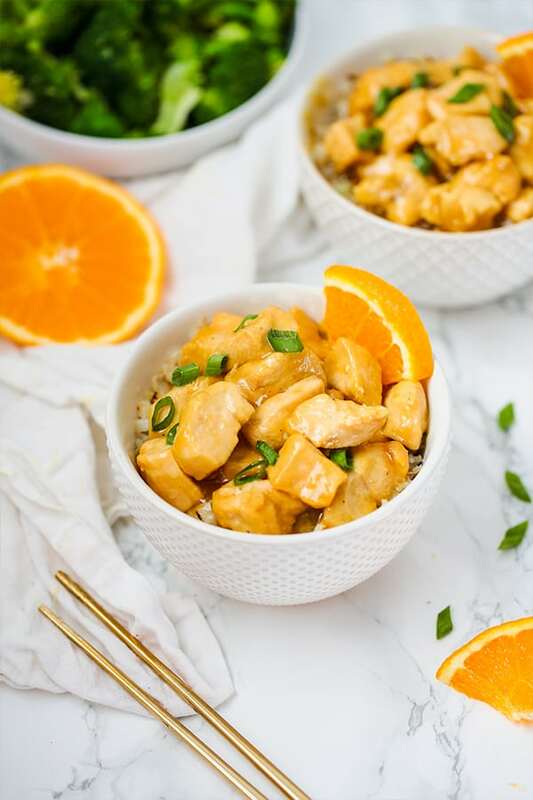 This slow cooker orange chicken is made with all real ingredients and is made quickly in the slow cooker, so you won’t even miss takeout! Just add everything to the slow cooker, set it, and forget it! I made this in the slow cooker in two hours, so it’s perfect to start to make right when you come home from work and have a fresh dinner in two hours with minimal work! Chicken, fresh orange juice, honey, and other real food ingredients. 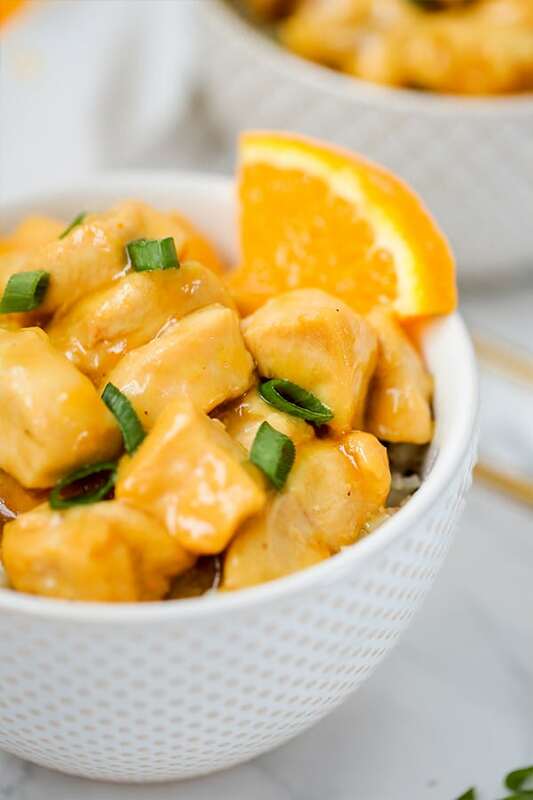 Orange chicken from restaurants is loaded with junk, and most homemade versions are made with sugary orange marmalade… not this one! I don’t recommend orange juice from concentrate from the store. You can either get fresh orange juice from health food stores or make your own. All you need is 1/4 cup! This gives the dish that sticky and delicious consistency! This is the swap for soy sauce that makes this recipe soy and gluten free. 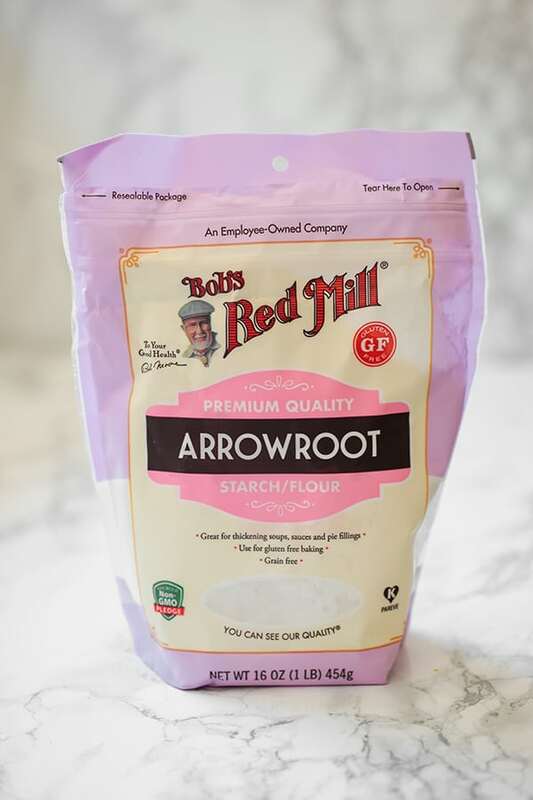 I use Bob’s Red Mill arrowroot starch, which is one of my secret ingredients for making sauces without the junk! It thickens just like cornstarch, but it’s grain free paleo, and AIP friendly. I use arrowroot starch in baked goods, sauces, soups, and for crisping up proteins. It’s one of those ingredients that I never let myself run out of and always find myself using regularly. Add the coconut oil to the slow cooker and set to high. Stir in the chicken and arrowroot starch and stir to evenly coat the chicken pieces. Stir in the coconut aminos, honey, orange juice, salt, pepper and ginger and mix until thoroughly combined. Cook on high for 2 hours or low for about 4 hours. Check towards the end that the chicken has reached 165 F internal temperature. Turn off the slow cooker once the chicken is cooked. Mix the chicken well with the sauce and top with green onion. Serve with steamed broccoli, cauliflower rice, or bok choy. Looks amazing, I can’t wait to try it!!! Would this recipe work using an instant pot? Looks delicious. How would you modify if you wanted to make it in an instant pot? Thanks!! Any ideas on Instant Pot conversion for cooking time? Can youu please tell me , what are coconut aminos. Would this work with sugar instead of honey? My nephew can’t have honey? This recipe looks super yummy! I can’t wait to try it in my slow coooker. I don’t have arrowroot, can I use instead tapioca starch? I can’t wait to try this recipe over the weekend. Would tapioca starch work instead of arrowroot? The flavor of this recipe was really good! However my “sauce” wasn’t very saucey. It ended up being almost gummy. I did use cornstarch instead of arrowroot (I couldn’t find it at my grocery store). And my coconut oil was in a solid state. Would you say either of these could be the culprit? Like I said, flavor was great! Even after scraped the gummy stuff off, the chicken still had plenty of flavor! Looks so good! Can you tell me if you use fresh ginger or ground ginger? Thank you so much Sarah!! This recipe was awesome! I was skeptical that the sauce would really thicken in the crockpot because it seems so liquid-y when you initially start it. 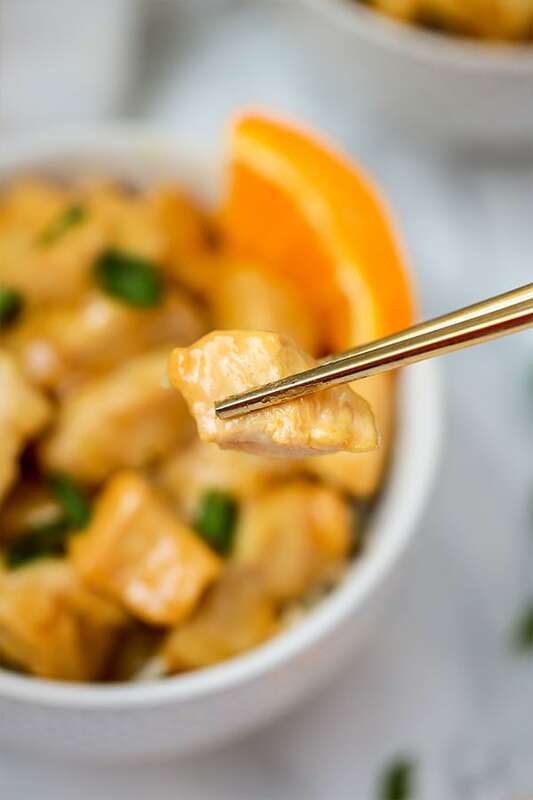 To my surprise, it thickened to the perfect consistency- reminiscent of takeout orange chicken without the nasty ingredients, stomach ache, and the guilt! Next time, I think I’ll add some orange zest and maybe a Tbsp of vinegar for a little extra brightness/tang, but otherwise it was delicious and will definitely be in regular rotation at our house. Thanks Michelle!